Every now and then I get ahold of a CD that captures me. It sits in my CD player night and day, and I wake up in the morning and switch it straight on. This CD is one of those. This is an album that was originally issued as Folkways 03539 in 1979, and it's taken a long while for it to come around again. We can be thankful to Smithsonian for this re-release because it is absolutely fantastic. 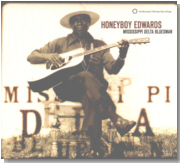 No lover of Delta blues should be without this CD. Dave "Honeyboy" Edwards is a bluesman who learned at the feet of Robert Johnson, Charlie Patton and Big Joe Williams in the 1930s. He made his first recording in 1941 for the Library of Congress, and his first commercial recording ten years later. During the early 50s he recorded for Sun, Chess and ARC, and then produced a small string of good albums during the 1960s. However, to my mind, this is possibly his best ever and it shows his talents and his roots to the full on every track. There are 12 music tracks (and one track of Honeyboy talking to an un-named interviewer), two original tracks written by Honeyboy, and covers of tracks by Tommy Johnson, Robert Johnson, Howling Wolf, Magic Sam, Memphis Minnie etc. Personally, I found it really difficult to get beyond track three, as the first three tracks are so good that I just kept playing them over and over for ages. Track one is a cover of the old Tommy Johnson number "Big Fat Mama," which Honeyboy obviously enjoys playing as you can hear him break into laughter now and then. Track two is Robert Petway's "Catfish," but with a verse from Muddy Waters' "Rollin' Stone" added to personalize it. Track three is a combination of two Robert Johnson songs, "Sweet Home Chicago" and "Dust My Broom," although both songs contain verses that Robert Johnson didn't use. This seems to be a favourite trait of Honeyboy's, taking an established song and adding a new verse, or the verse of another song, to make it his own. It makes for some interesting listening. I could go on for pages about this CD, it's that good. Just go out and buy it and see for yourself!